Demi Lovato, Lucy Hale, Tyler Posey and more stars glammed up the red carpet at the Teen Choice Awards last night, and now you have a chance to win the same gift bag they took home! 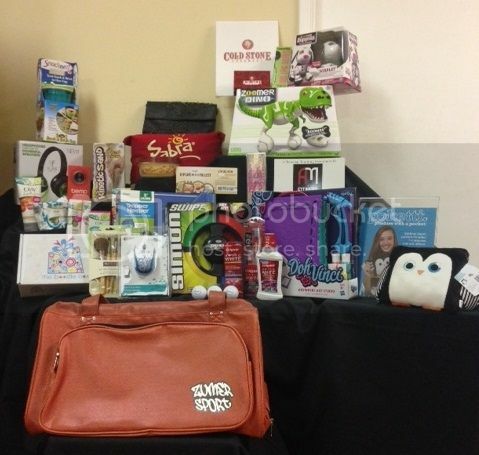 We're giving away one Teen Choice 2014 gift bag to a lucky winner, and wait until you hear about the bounty that awaits! Cold Stone Creamery®- A gift card for delicious + creamy, Cold Stone Creamery ice cream; made fresh daily! Dell Venue 8 Tablet- The Dell Venue 8 tablet provides enjoyable entertainment and productivity in an attractive, thin and light design. Whether reviewing a presentation or kicking back to watch movies, the Full HD screens deliver brighter viewing angles and a better viewing experience, even outdoors. Based on Android 4.4 “Kit Kat”, the tablets feature the latest Intel Atom Z3480 processors to drive faster web browsing and media editing, contributing to a premium mobility experience. Prize includes Dell branded golf balls. Hasbro Inc.- Simon Swipe- The bold new game is a modern take on the classic recall challenger SIMON game. DohVinci- Creativity pops off the page with DOHVINCI art and design kits; an entirely new art experience from the makers of PLAY-DOH brand modeling compound! Ideavillage Products Corporation- Snackeez- Clever design lets you hold a 16 oz. drink and your favorite snack, all in one hand. Seals perfectly to keep snacks fresh in the cup. FLIPS AUDIO- These headphones provide crisp, clear, high definition sound experience. They flip into powerful speakers with a powerful sound delivered by proprietary technology. Super-charged sound provided by a powerful lithium ion battery. USB rechargeable for hours of extraordinary. MCFADIN- Handcrafted handbags and luggage made in Texas by sisters Stacy & Laurie McFadin. Olay Fresh Effects- Olay Fresh Effects product. Prize contains one item. Sabra Hummus- Sabra Dipping Company, LLC is a leader in the refrigerated dips and spreads category and producer of America’s top-selling hummus. The Boodle Box- The Boodle Box is a monthly subscription box full of adorable accessories and beauty products that encourage girls of all ages to uncover new things and discover themselves in the process! Celebrities will receive items such as EcoTools, ban.do, jewelry by Tai and more in The Boodle Box. Trapper Keeper®- Hitting halls in 2014 is a brand new line of Trapper Keeper products, featuring the classic style generations loved with the innovation and durability of Mead® products. ZOOMER DINO & ZOOMER ZUPPIES- Spin Master’s next generation of toys are incredibly intelligent and as realistic as they come. Using a unique combination of technologies, our pets come to life as the perfect addition to any family. Prize includes Zoomer Dino. Colgate Optic White- The Colgate® Optic WhiteTM Toothbrush + Whitening Pen contains a built-in whitening pen for convenient whitening. It’s as simple as brush, whiten, go for whiter teeth in 2 days. Use with the Colgate® Optic White® PLATINUM Whiten and Protect™ Toothpaste and Colgate® Optic White® WhiteSeal™ Mouthwash for whitening results even faster – brush, rinse, whiten and go – for whiter teeth in 1 day. Logitech Bemo- The Logitech Bemo is a social video camera that turns your adventures and everyday moments into movies, and lets you share them on the go. Logitech Mice- The 2014 Logitech Color Collection which is Logitech’s sixth-annual design collection offered on Logitech’s most popular mice, is designed with a pattern and color for every mood, personality and style, allowing everyone to express their individuality. Poketti® Plushies with a Pocket- Designed by a 14-year old young entrepreneur, Poketti Plushies with a Pocket are soft animal pillows with a useful pocket on the back to hold your phone, a notebook, glasses, or other small treasures. WACKYTIVITIES KINETIC SAND by SPIN MASTER- It’s more fun when it’s Wacky! Kinetic Sand is the squeezable sand where you can FEEL the fun! You’ve never felt anything like it! Pack it, pull it, shape it and love it, Kinetic Sand is so incredible you can’t put it down. It’s kinetic – meaning it sticks to itself and not to you! It oozes, moves and melts right before your eyes. It flows through your fingers like a slow-moving liquid, but leaves them completely dry. Shape anything you want and use it over and over again. Kinetic Sand never dries out and is gluten free. This soft and stretchy sand easily cleans up while delivering non-stop fun! It’s squeezable sand you can’t put down. Feel the difference with Kinetic Sand! Andrew Mitchell Fitness- Learn how to sculpt the body you need with 3 one hour training sessions led by Los Angeles trainer Andrew Mitchell. Invitation Consultants- Invitation consultants personalized bookmarks are the perfect way to express your style and keep organized! Rolf Bleu- Hands free Chanel inspired purse/phone case and iPad mini cross body case. You don't have to sacrifice fashion for function! VOXX Electronics Corporation: Audiovox ShutterBall- Take Epic Selfies with Audiovox ShutterBall! ShutterBall is a Bluetooth powered remote shutter that pairs your smartphone camera via an app that allows you to take epic selfies, group shots and videos without having to endure the contortions of pressing the trigger on your smartphone! Say goodbye to awkward selfies and never be left out of that group photo again! ZUMER SPORT- Zumer Sport Basketball + Football Duffel Bags- Made From Actual Sport Ball Materials! Click here to enter and here for the official rules. NO PURCHASE NECESSARY. Open to US residents 18 and older. Entries must be received by August 13, 2014 at 11:59pm PT to be eligible. Approximate retail value: $1,180.